Those with organizational power can sometimes forget that their power is limited to the organization. Achieving high levels of organizational and personal performance requires a clear sense of those limits. Sometimes organizations or their leaders confront problems over which they have little control. For instance, a manager might want a supplier offshore to deliver something right after an important national holiday. Even if the supplier agrees, the holiday might cause delays, because some employees might take extra days off. To acknowledge this risk is to accept the larger reality of the limits of the manager's control. The manager cannot control the behavior of the supplier's employees. 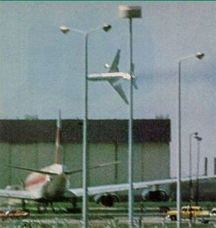 American Airlines Flight 191, moments before its crash near O'Hare Airport in Chicago in 1979. The crash was due, in part, to engine strut failure caused by use of an unapproved engine maintenance procedure. The mandated procedure assumed that the engine would be removed first, and then the pylon. By removing them together, as a unit, the airline reduced the total effort required, but the procedure caused stresses on the pylon. (See FAA animation) Those stresses initiated a gradual cracking process, which eventually led to the accident. Subsequent inspections of other aircraft that had been subjected to the procedure uncovered nine other cracked engine mounts. Photo courtesy U.S. Federal Aviation Administration. Recognizing these limits can be difficult, because organizational leaders have day-to-day experiences that demonstrate their substantial power. Those experiences can obscure the reality of limited power, causing those leaders to make decisions that defy reality. Reality does constrain even those with organizational power. Here are some of the forces of reality that we simply must accept. Leaders sometimes create expectations or make demands that cause the led to attempt to violate laws of Nature. For instance, in 1979, American Airlines Flight 191 crashed on takeoff as a result, in part, of engine strut failure due to stress cracks created by using an unapproved maintenance procedure. 271 people died. Those who create environments that encourage people unknowingly to try to circumvent physical law could be setting themselves up for higher turnover, degraded morale, ridicule, or criminal prosecution. Requiring work schedules that conflict with holidays, major sporting events or other observances, whether or not they have legal status, can cause staff to conceal their absences, or worse, to report for work distracted, exhausted, or otherwise impaired. The cultural constraints of our societies are far more influential than anything the organization might try to assert. might try to assert work quality degrades, rework rates increase, and turnover becomes inevitable. In most cases, requiring inhuman conditions or excessive hours as a way of reducing costs or circumventing regulations is shortsighted. These practices are toxic to the organization and cause the most capable people to leave. If working conditions are below the norm, or compensation is below the norm, the quality of the work force eventually declines below the norm. The cost of managing an inferior work force is usually higher than the norm. Leaders get to choose: spend money on the work force and working conditions, or spend money dealing with a resistive workforce, higher turnover and output quality issues. You can't minimize the costs of both. Would you like to see your comments posted here? rbrenVrLmFmLOsbUnIESnner@ChacwzVkfINxbourFgYHoCanyon.comSend me your comments by email, or by Web form. To save time, or to find a time everyone has free, we sometimes meet during lunch. It seems like a good idea, but there are some hidden costs. It goes by various names — self-talk, inner dialog, or internal conversation. Because it is so often disorganized and illogical, I like to call it inner babble. But whatever you call it, it's often misleading, distracting, and unhelpful. How can you recognize inner babble? Everybody has pet peeves about work. Here's a collection drawn from my own life, the lives of others, and my vivid imagination. See also Personal, Team, and Organizational Effectiveness and Managing Your Boss for more related articles. I offer email and telephone coaching at both corporate and individual rates. Contact Rick for details at rbrenFCfvNEWzWIdlBUnmner@ChacBKtBsakMNytDBRByoCanyon.com or (650) 787-6475, or toll-free in the continental US at (866) 378-5470.